Professional Duct Cleaning: Help Your Family Breathe Easier | Fresh Air, L.P. If you’re anything like the average homeowners, chances are you don’t think very much about the ductwork snaking its way through your home. After all, these air ducts are hidden from sight, traveling through spaces between walls or through your attic space. Exposed ducts may be common in some types of commercial spaces, but it’s definitely not the norm in residential spaces. This is something you should think about though. This is partly because ductwork that’s suffered damage will lead to poor heating and cooling performance, and a rise in your energy bills. For this, you will want to look into professional duct repair or sealing. Yet another factor to consider is the cleanliness of your air ducts. When is the last time you scheduled air duct cleaning in Sugar Land, TX? What Contributes to Dirty Ductwork? Dust and various airborne particles circulate into and around your home throughout the year. Most of these particles pass through your ventilation system multiple times. You might be surprised to learn that a six-room home can circulate up to 40 pounds of dust in a single year! This dander, dirt, dust, lint, and other particulates settle on the inner duct walls of your ventilation system and start building up. And the more buildup is in the ducts, the faster it will accumulate. Ductwork that’s clogged up with dust and dirt is not something you want, the same way you wouldn’t want an air filter to be too clogged up. This doesn’t allow your HVAC system to operate as effectively as possible, and also contributes to poor indoor air quality. Having your ducts professionally cleaned at least every few years provides you with a cleaner, fresher home. Cleaning the ducts eliminates a huge reservoir of dust and debris you don’t want circulating throughout your home. Cleaning the ducts helps your home stay clean and removes contaminants from the air that can impact your health and comfort. Improving Energy Efficiency: The debris in your air ducts put friction on the airflow coming through. In turn, this forces the blower of your HVAC system to work harder than it should have to, draining more power. If you’ve noticed your utility bills spiking, the source can certainly be clogged up ductwork. Preventing HVAC System Damage: All the dust and other particles in the ventilation system means your HVAC cabinet is also at risk of contaminant buildup. This can damage motors and cause the condenser coil to freeze over, among other problems. Give the Pros a Call! 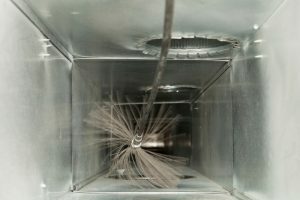 Duct cleaning typically isn’t a service most homeowners need once a year, but if you’ve never had it done before then there is no time like the present to schedule it. And why do we recommend professional duct cleaning rather than homeowners trying to access their ducts themselves? Well, simply put, ducts aren’t easy to access! You might end up doing more harm than good, resulting in the need for duct repair or replacement. Fortunately, you can rely on our team for whatever your ductwork service needs may be. To improve your indoor air quality, get in touch with Fresh Air, L.P. today!